Its AM and my north- west facing windows are full of lovely diffused light--(and none of the sun's glare!) and it will be easier to see the details of t he reverse engineered heel flap. 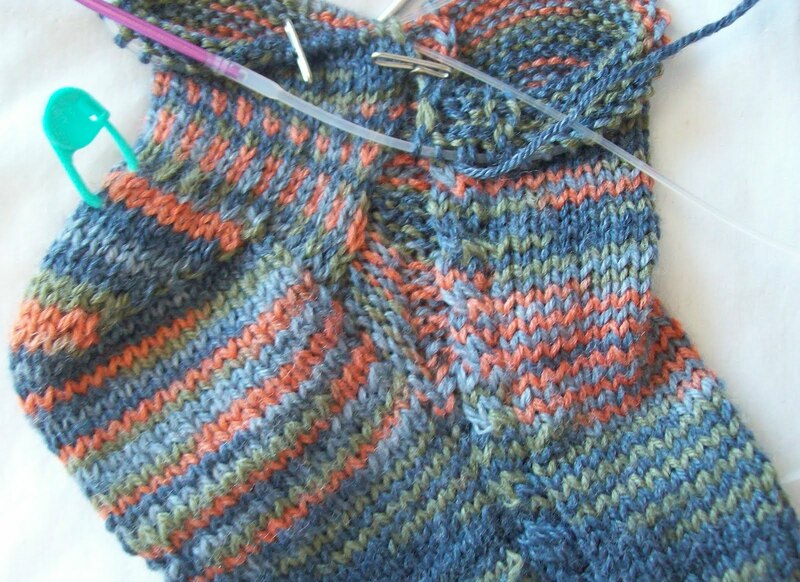 And a few more round on the sock help things along, too. 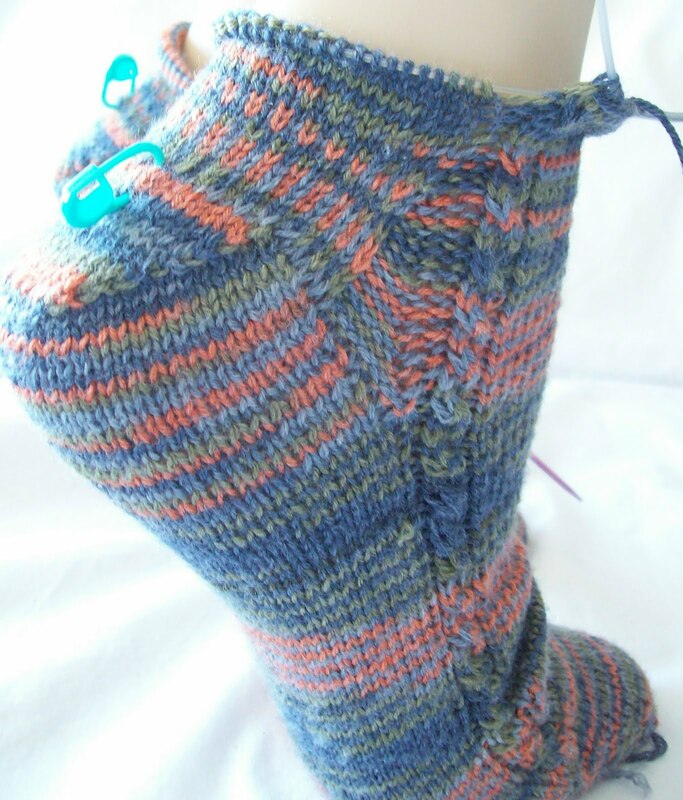 The turning part of the heel is not on the sole part of the heel, but on the back of the heel (and it works just as well!) --see the image on the left-- when the sock is on the manikin legs. The gusset is worked in reverse socking knit—letting the small cable carry the “LINE” of the decreases alone. The knitting above the turning, (the rows worked while working the gusset) are worked in a slip stitch –(where—in my after 7PM fried brain—I messed up) where ever row is work (not every other row) with a slip stitch –which brings me to a correction. The slip stitch I did works great (on) even if it looks a bit weird off. It makes the sock tight around the back of the ankle, AND it shortens the sock there too. (Ever notice how you sometimes get a wrinkle above the back of the ankle? Not with these socks! The sock really needs to be just a smidge shorter at the back of the ankle (unless you are shoeless) —and this slip stitch is shorter (row gauge) than heel or (The correct) eye of partridge stitch. The flap (on average) is usually equal in row length to the number of stitiches. (30 stitches/ 30 rows, (2 sets of 15 chains) 30 stitches picked up for gusset. But the gusset is often much shorter in one direction than it is in the other. --> then the gussets are created by decreasing to original number--(30). 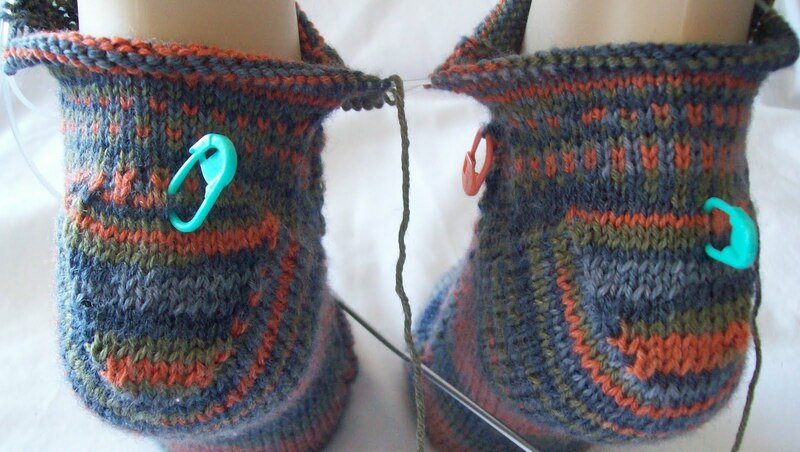 Since there are 10 extra stitches, the gussets are shorter –in rows—than the flap. 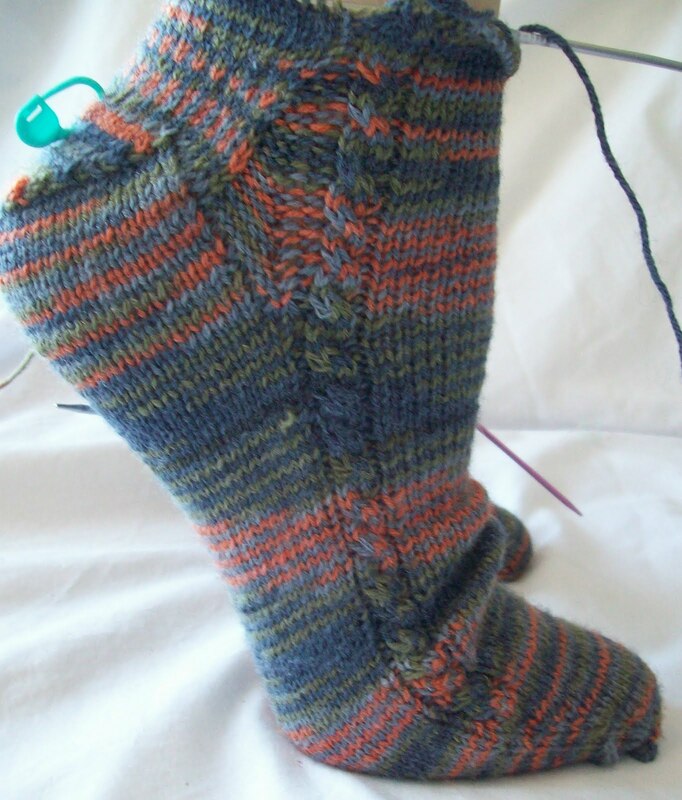 With a reversed F/T/G heel, about half the back of the heel is made form the turning—the rest is made from the gusset rows. In this case, 12 stitches to decrease, 2 every other row, for a total of 12 rows. These change the LOOK of the back of the heel- (it looks different!) but not the fit—It fits pretty much the same. On the manikin legs (I've been corrected and told I must use the french spelling (maniquin) but the simpler version is also acceptable!) --you can see how the heel fits. With a few extra rows, it is so much easier to photograph—but as I said, the sock is still loose since the manikin is smaller than my foot or leg. (this is much less noticeable when I photograph the finished socks).